Beijing Day 2 - Walking in Modern and Ancient History. Sunday 24th august Walking in History -Both ancient and Modern. Blogging at a window overlooking Beijing. Its a pinch-me moment - the "i cant believe I am here and now" moment. Infrastructure is incredible - the buildings are taking my by breath away in their audacity to defy gravity Apartments are built in their dozens, reaching up to the skies and out to the horizons. There is a road which is long enough, wide enough to land any plane in the world, if I ever needed too. And if I actually owned a plane. Mind you a news broad cast yesterday had a Chinese fighter plane doing cheeky barrel rolls over an american survaliance aircraft so flying in Chinese airspace is probably not recommended. First stop today is the Summer Palace where we joined an estimated 45999 tourists (down from Sundays 49000) walking, sitting, eating, photographing, chatting and enjoying the cool breezes off the lake. 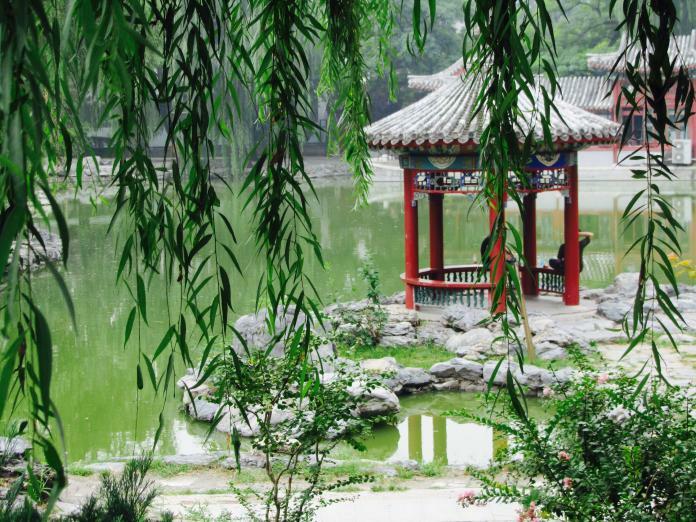 This is a place of waterways, bridges, palaces, pagodas, willow trees and lotus flowers. Its a recreational area too, with a huge lake full of paddle boats busy aimlessly paddling. I heard a band playing and watched older men walk around with big water filled sponge pens drawing pictures of animals and greeting words. For a brief few minutes I was the centre of attention as one drew my face on the pavement and smiled happily at me before the hot sun dried the water marks as if they had never been. The colour-thing has been explained. Ive been missing the wild passionate colours of Indian travel. In China colours were reserved for classes of people, if you were an emperor your colour is gold. Royalty used green, blue (as in heaven & sky) is for the spiritual places, the monasteries. Red anyone can use as decoration. And grey, grey is for the common person. Which is all a bit dismal. But not as dismal as Tiananman Square, the site that brought the worlds attention to China during the 1989 student riots. We heard the story from Ming and he pointed out the significant buildings around it, The great hall of the people, Mao's mausoleum and a museum among others. The square is enormous, built to hold 500 000 people. It was hot and windy and big red flags flapped in the breeze. Mainly Chinese wandered around or sat in groups, hat sellers tried to sell colourful hats and other knick knacks and I found it all very gloomy. What did happen to the young man who lay in front of the tank. If he had known that he would become an anonymous enigma to the world would he have done it still? The boy and his plastic bags versing massive iron tanks fronting the might and power of China. Across the square and under the pedestrian subway of the "road-that-you-can-land-an-areoplane-on" is the Forbidden City. Built in the Ming Dynasty it was the home to emperors, their families, concubines, the 8000 servants and it was the political and ceremonial centre of China. Everything is built to a code, in perspective to other things and full of symbolism. Forbidden by the emperor no more, we joined tens of thousands moving from one enormous square to the next. Each square is surrounded by timber buildings (980 of them all together) that exude power. Even the bricks used pave these squares have a story. Many brick makers were used to make these bricks, and each brick had to have the name of the maker put onto the side. If your bricks started disintegrating then your life was ended, much sooner than you expected, which seems a tad harsh but may have made the quality much higher than usual! Apparently much of the Forbidden City had to be repaired when the revolutionary zeal of the Communist Party swept through China in the late 1940s. And, just quietly, if they had brick makers as their ancestors who could blame them? Again I find the the hugeness of the vision is over whelming and I find myself saying "hello" to the cute children or enjoying the outline of the Chinese roof lines against the blue sky. Or for a while getting onto computer server outside China so I could facebook a "checkin" at these historical sites. Which makes me look ever so shallow at a place where for centuries ancient emperors ruled kingdoms and built dynasties and cities that would last to this day. We had the evening to ourselves so after a brief discussion John and i had 30 min electric bike rickshaw ride around the local area. Lights were just turning on and it was pretty but mostly I loved the beautiful Chinese women who was our driver. Her back ramrod straight, long black pony tail flicking she wove us through traffic with serenity. She smiled, waved and greeted so many locals as she passed them, they in turn smiling and waving at her affectionately. Love to know her story but it was hard enough asking for a ride. We had dinner at a turkish restaurant - as you do in China after eating Chinese cuisine for a week straight. The proprietor beckoned us in with lashings of enthusiasm and handshaking and certainly it was a full and bustling place with delicious food and an inordinate number of russians smoking the hookah. As we walked back to the hotel a young lad offered brochures on massages and we took him up on it. Across the intersection to a busy little hairsalon/ beauty parlour and we lay back in big velvet chairs for an hour having our feet massaged. It was Johns first foot massage and he had a lovely Russian girl, Gola, doing wonders to his feet. Not surprisingly he has not stopped talking about it! The shop had at least eight young people all wandering around, chatting, laughing, texting or doing beauty treatments or haircuts. It was a happy place to spend an hour or so. They tried to upsell me - both a face massage and wrinkle treatment (thats If I understood the hand signals) and I do believe they thought my hair could do with a good cut. But by now its 10pm and exhaustion has replaced enthusiasm for any upgrading of my looks and decided returning to the hotel to sleep would do the best job of all. Joan What wonderful times! The colour thing Is really interesting after the riot of colour of India, which I love to bits!